60th Anniversy of Good Design Award celebrates "60 years of GOOD DESIGN AWARD" with this traveling exhibition, featuring iconic Japanese design from 1957 to the present. The Good Design Award, which is celebrating the 60th anniversary of its establishment, has continued awarding "good design" ever since the establishment in 1957 of the Ministry of International Trade and Industry sponsored "Good Design Selection System (popularly known as the G Mark Program)". In this exhibition, we look back upon the many different designs that have accompanied people's lifestyles from period to period and introduce the designs receiving the Good Design Award and the Long Life Design Award in the four sections of "Designs that Changed and Supported People's Lifestyles," "Progress in Life and Industry Guided by Design," "Brands that Continue to be Loved and their Designs," and "The Future of Touch". Among the displays are the 1958 Honda Super Cub C100 from the Honda Museum, Sony's first Walkman, Toshiba's original rice cooker, the Pocky chocolate stick, and more of Japan's innovative product design and packaging that marked the 20th century up to the present. Don't miss this and visit GOOD DESIGN STORE Bangkok, Level 4, Central Embassy. The Good Design Store at PMQ presents the most recent exhibition by 2015 Good Design Award Winner, Tri-Wall. The name "Tri-Wall" came into existence in the early 1950's when Abe Goldstein, a small box maker in New Jersey, USA, invented the manufacturing process for a new, heavy-duty corrugated material he dubbed "Tri-Wall Pak(R)". Today, the Tri-Wall Group is still evolving. Their Asian network continues to expand, even as they increase our global awareness and broaden their corporate goals. They are carrying the Tri-Wall name into non-packaging related areas; creating new products and services using the same world-class standards for innovation, quality, and customer-driven performance that Tri-Wall established over half-a-century ago. Tri-wall's experience of disaster zone aid through cardboard furniture made possible the creation of tables of very few components with simple assembly, saving waste and time. Though light, they can support over 150kg in weight. As they can be completely disassembled, they take up little space for transport. As the components were made of cardboard or iron, they can be easily recycled. Limited seats, first come first served. Exhibiton & Design Talk #16 - What makes a GOOD DESIGN ? Over this period, conditions in industry and society and the issues that we face have greatly changed, and the aim and role of design has also expanded accordingly. The Good Design Award has apprehended the signals coming from life and society at different times and has always confronted the question of "what is good design?" from within that context. We are told that this journey has been a "milestone" in the journey of industry and design. Exhibiton - What makes a GOOD DESIGN? - For Life, Society, Future. In this exhibit, we look back upon the many different designs that have accompanied people's lifestyles from period to period and introduce the designs receiving the Good Design Award and the Long Life Design Award in the four sections of "Designs that Changed and Supported People's Lifestyles," "Progress in Life and Industry Guided by Design," "Brands that Continue to be Loved and their Designs," and "The Future of Touch". Our January-February Exhibition is from Hong Kong's legendary designer Alan Chan. This exhibition documents Alan Chan's design career, which has been fully embraced and supported, personally and professionally, dated back in the 1980s until now. 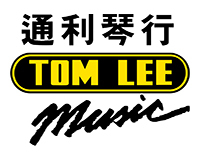 Recommended by Ikko Tanaka, Alan's first project in Japan was for the "Hello Hong Kong" promotional campaign at Seibu Department Store in 1987. Through this exhibition of his works in Japan or projects collaborate with Japanese designers, the younger generation of Hong Kong designers will know more about the historical linkage between Hong Kong and Japanese design. Our Novemver-December Exhibition is about The Tsubame-Sanjo Region, which located in Middle of Japan. Tsubame and Sanjo are two cities located in central Niigata Prefecture. Tsubame-Sanjo is a thriving area that enjoys traditional blessings from nature while producing some of the world's finest machined metal products. The area has a history of developing a range of everyday metal goods that support our lives, and it is in this way a place where tradition and industry coexist. 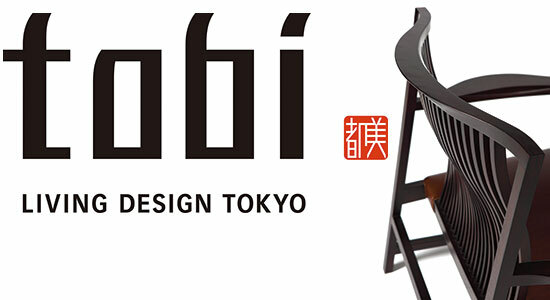 Speaker: Mr. Mitsunobu Hagino, Product Designer, FD Inc.
Our October-November Exhibition is from tobi, which is a furniture brand created as a joint enterprise of eight order - made furniture manufacturers in Tokyo Japan. This exhibition introduces tobi's genuine furnitures. 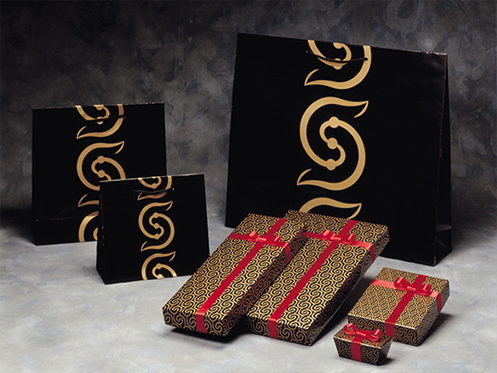 The brand, which embodies the artisan spirit inherited from the traditions and techniques of Shiba Furniture, was created not with the simple aim of selling products, but rather to uphold and hone the traditions of fine Japanese craftsmanship. Our October Exhibition is from BUNACO, which is a Japanese traditional wood craft company founded in 1956 Aomori Japan. This exhibition introduces BUNACO's innovative technique "From Flat to 3-D" creating new designs with wood strip. BUNACO's exhibition offers rare opportunity to see its uniqueness, introducing in Hong Kong for the first time ever. * In case of too many applications, we will hold a draw for place allocation. Our August Exhibition is from Balmuda, which is a Japanese electrical appliances manufacturer well-knowned for their beautiful design. This exhibition introduces Balmuda's philosophy, which is to pursuing beauty through minimalist design. BALMUDA product Promotion Talk on 29th Aug and on 12th Sep.
Our July Exhibition is from UDS, which is a Japanese corporation which plans, designs, and operates unique hotel businesses. UDS x 誉都思 EXHIBITION suggests the future possibilities of hotels and commercial facilities through the works of UDS Ltd. Founded in 1997, with a motivation to create design systems of a city, their field is starting from residential to office and commercial design, the company had been recognized in many fields by proposing new values into the market. Having branches in Shanghai and Beijing, UDS currently works on hotel/commercial design projects in Asian countries. UDS was recognized in 2002 for designing the Japan's first boutique hotel, CLASKA, and for continuously creating unprecedented and internationally awarded hotels including Hotel KANRA Kyoto, a small but luxurious hotel with the traditional styles of Kyoto, Hotel ANTEROOM Kyoto which features art & the current culture of Kyoto, and Shinjuku Granbell Hotel which collaborates with the next generation of Asian artists. The latest works are Hotel EDIT Yokohama and GRIDS Hostel Lounge Akihabara, both of which propose hotel’s existence as a core of its local community. This exhibition introduces UDS’s challenging effort in reaching out to new fields and its creative processes of realization through the works that indicate possibilities of next commercial spaces in Asia. Panels and products express UDS persistency and its history, and the videos introduce people and their dedication for the next challenge. - "OBJECTIVES - Design for the Domestic Landscape"
Our June Exhibition is from Office for Product Design, who is a design studio formed in 2007 by Nicol Boyd and Tomas Rosén, who originally began their collaboration while studying at the Royal College of Art in London. As designers, they have a fascination with the role of these small utilitarian objects. They like to consider them as an opportunity, not only to address a practical need, but also to act as an important form of visual and emotional punctuation in our daily lives. Their objective is to create products for the home that embody a quiet confidence, and which reveal flashes of character and thoughtful consideration through use. They compliment the context in which they are used rather than dominate it, and while they may be ubiquitous, sometimes even unglamourous, they are nonetheless designed to stand up to the closest inspection, while never overtly demanding it. Over the years they have continually come back to our interest in household objects as a way of refining the details of domestic life. In this exhibition they present some of our recent commercial work for the brands Thomas/Rosenthal (Germany), no.30 and JIA Inc. (Taiwan), which all touches upon this theme. Chanoyu, “The Way of Tea” comprises not only of the act of ceremonial tea, but involves an entire culture including architecture, food, flower arrangement, sake (fermented rice wine), sweets, pottery, metal working, and calligraphy. At the beginning of the long history of Chanoyu, the practice of “The Way of Tea” was at the cutting edge of culture and hailed in a new wave of arts. People enjoyed their creativity and competed with each other to produce new ways of artistic expression and production. 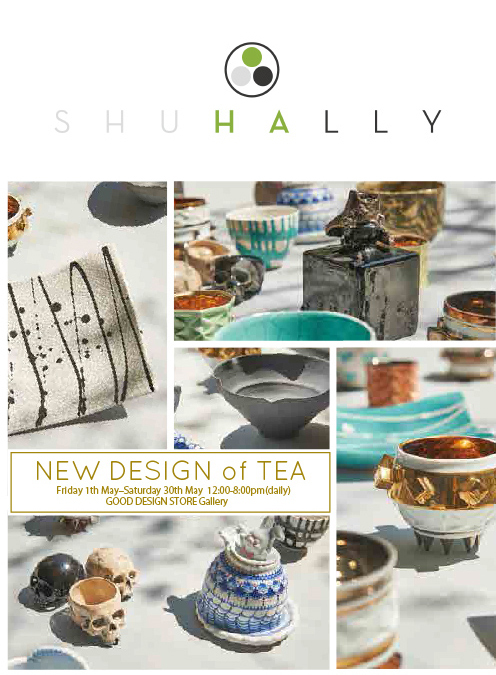 Now, we at SHUHALLY would like to introduce to the wonderful people of Hong Kong, a new way of enjoying ‘The Way of Tea,’ set amidst the creativity and new designs of young artists in Japan. What is presented here in this exhibition may be informed by the traditional, but everything here is created with a consideration for new ideas, new creativity, and a sense of play. We invite you to join us in experiencing the SHUHALLY style of Chanoyu, where rules are encouraged to be broken and the simplicity of enjoying tea is celebrated. Founder and master of SHUHALLY*, Souryou Matsumura introduces chanoyu, along with Noh Farce, Japanese Kimono, wagashi (Japanese sweets), and Pottery. His own tea room Bunsaian,文彩庵,producing by himself won Good Design Award 2010. *Shuhally - meanings,守 - Shu - The Fundamentals, 破 - Ha - Breaking of tradition, 離 - Lly - Parting with Traditional wisdom. Our Exhibition on this April is "What makes a GOOD DESIGN ? 2015". This is the second exhibition of "What makes a GOOD DESIGN?" that we had shown as a opening exhibition of GOOD DESIGN STORE and had met with a favourable reception last year. This year, the exhibition theme is "how design can influence topical issues?". We are focusing on 12 topical issues and showing 12 examples, such as NIKE, SONY, SHISEIDO, CASIO, and ISETAN which is Japanese old established department store, that the design can work well for these issues. You will touch some futuristic and amusing ideas in the exhibition. As well as picking good design out of known facts, it is important aim of GOOD DESIGN AWARD to discover and to nurture emerging designs that hold new possibilities and potential, even if they are not yet fully formed. 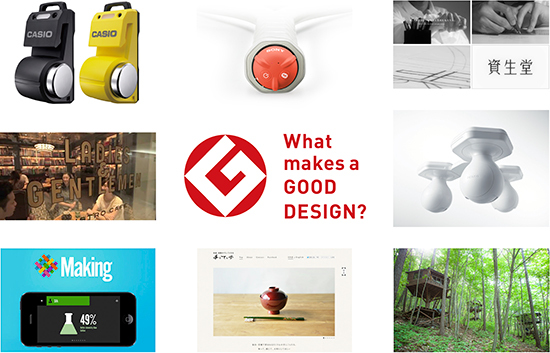 Now we're also calling for application for GOOD DESIGN AWARD 2015. Would you share your design with us to find a clue of topical issues that exists in this world? How can design initiate social innovation? 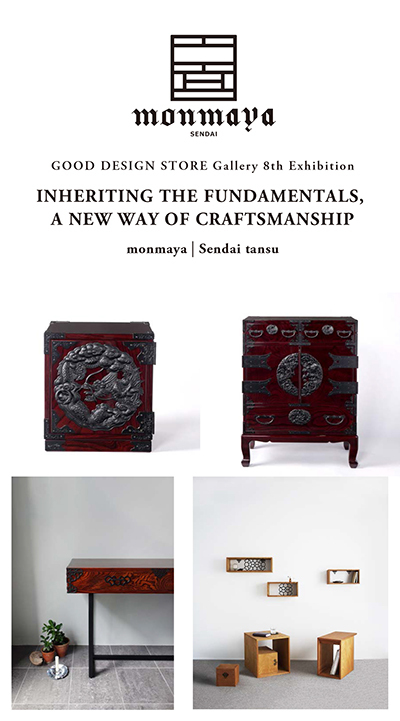 Our March exhibition is from Monmaya Sendai, which is the most well established brand in Sendai-tansu (cabinet) manufacturing for 140 years. Their cabinets and drawers are custome made and repaired by hand using Japanese grown timber, Joboji lacquer (extracted from trees in Northern Japan). The senda-tansu's greatest features are the strong durable beauty that is the join artistry of cabinetwork, lacquer, and metal fitting into one form. In this exhibition, the genuine Sendai-tansus will be shown and it is introduced their craftsmanship with lots of items and texts. Please be informed that we will be closed due to Year End and New Year holiday. All the inquiries and orders placed during the Chinese New Year holiday (Feb. 19 to 21) will be processed and replied back after February 22. May the year 2015 be meaningful and prosperous as ever for you! Our January exhibition is from SUPPOSE DESIGN OFFICE, which an architecture firm in Hiroshima and Tokyo, which leaded by Makoto Tanijiri and Ai Yoshida, high profile young architects. Cities consist of architectures, architectures consist of interiors, and interiors consists of furnitures. Then, do Furnitures consist of products? 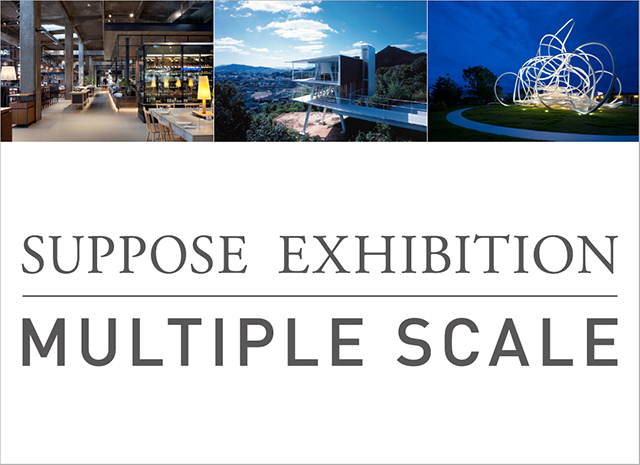 From large architectures to small products, SUPPOSE's design proposals always exhibit a special connection with the environment. They attract more people to architecture by enhancing such an environment with interacting at multiple scale levels. In this exhibition, SUPPOSE introduce their projects, its concepts, and their new products that just have born. A special gift for our customers! We will have a mini concert at our store with Good Design Award winning music instruments, Silent Guitar and Silent Violin, welcoming The Radio Express (RADIOEX). 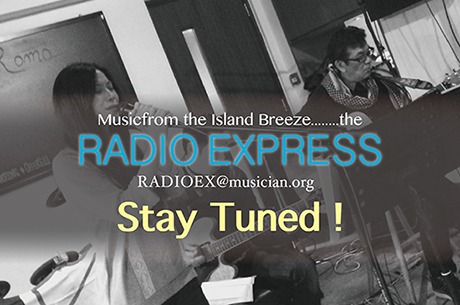 The Radio Express (RADIOEX) was born from a music community called PI Bandz in Park Island, Ma Wan. This is perfect for music lovers of all ages. Please join us as we usher in everyone's favorite season. Yamaha's "Silent" series are created on the basis of expertise in manufacturing high-quality handcrafted music instruments integrated with digital technology, giving everyone new ways to enjoy the unique qualities of the electric music instruments. Music of The Island Breeze, Feliz Natal !! Jademan on YAMAHA Silent Violin. Our December exhibition is Shogo Kishino (6D) who is an acclaimed Japanese art director and graphic designer. 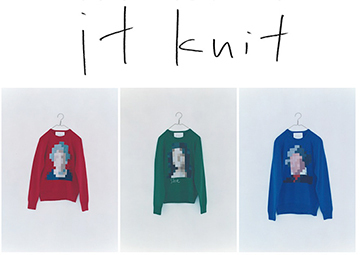 "it knit" is an original fashion brand created by Kishino. The Design Talk #5 & the reception party will be held on December 5th, inviting Shogo Kishino (6D) & Arnault Castel (kapok founder). Shibuya LOFT, which is the unique shopping site in the heart of Tokyo features PMQ designers and GOOD DESIGN STORE as "New Creators From PMQ". 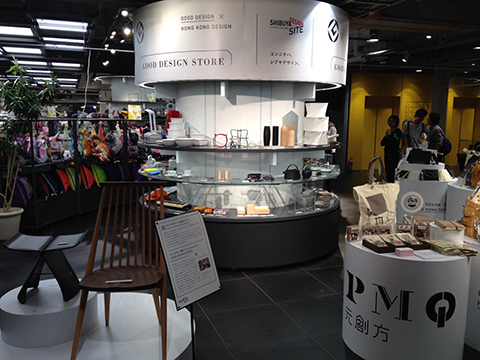 At the very front entrance, the new Hong Kong creative products are introduced extensively, and PMQ itself is presented to the visitors. Shibuya Design Site "GOOD DESIGN STORE" & "New Creators from PMQ"
One of the oldest Japanese public museum Tokyo Metropolitan Art Museum launched “TOKYO CRAFTS & DESIGN” under the mission of “The museum which values the tradition and promotes the marriage of tradition and new life". Our next exhibition features the crafts and designs of this project. The Design Talk #4 & the reception party will be held on November 12th, inviting the curator of this project Ms. Akie Kawagoe, of Tokyo Metropolitan Art Museum. dt@g-mark.org Seating capacity is 50. As the 2014 Good Design Award was announced, the newly-awarded items are added to our store more & more. Please come and see! We are pleased to announce the official launch of our new website. The new website provides much more information and services about our store and gallery. Please feel free to send us comments or feedback you may have. GOOD DESIGN STORE will hold a design talk event titled "KOKOCHI - sense of comfort-" on July 11 in PMQ, a creative complex facility locate in Hong Kong. This talk event is also a part of exhibition” KOKOCHI - sense of comfort - Naoto Fukasawa Meets GOOD DESIGN” that will held in PMQ from July 1. Naoto Fukasawa, who is active internationally as a product designer on behalf of Japan, will bring his design and share his thoughts about the key theme in design "KOKOCHI". We are currently accepting a pre-application for the talk event, admission charge for free. Venue sponsored by PMQ Management Co., Ltd.
#01 Naoto Fukasawa "KOKOCHI -sense of comfort-"
Date : July 11 5:00–7:00 p.m.
A store named "GOOD DESIGN STORE" is opened in "PMQ", a commercial facility built by Hong Kong government public institution to practice a new creative for industrial development. 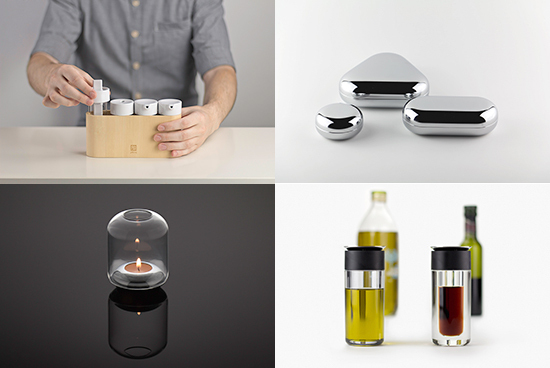 "GOOD DESIGN STORE" will sell awarded products and work as a base for Japan Design promotion. Hong Kong, such a vibrant and important city in both industrial and culture of Asia, will be a large international audience for Good Design Award and Japan Design.